Anyone who has been in a casino or a bar has probably come across a slot machine. They are one of the most popular games out there for those who want to gamble. Part of this is due to the fact that the game is very simple to play; just pull a lever and watch the reels spin. Another contribution to the popularity lies in how a person can win a rather large amount, even if they bet a little bit. Most players simply put in a bet that they wish to wager and pull a lever (or push a button.) The reels spin and images on the reels slowly line up, creating a row of images. The main goal is the get three matching images lined up across the center of the display, but different payout lines can mix up the odds a little bit. In simple terms, a slot machine has a number of payout lines that cross the reels. If any of these images on the reels match on any of the lines, you have the potential to win. Various symbols can pay the player in different ways, so it is important that you take a look at the payout table and see how each machine works. The payout table will help you understand the rules of each specific machine, making it a very helpful piece of information. 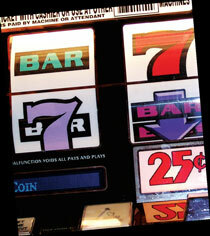 While some people look at slots as a random game of chance and a waste of time; that is not necessarily the case. Unlike blackjack and poker, slots are a game that only relies on your level of luck luck. If you play poker and simply trust you luck, you'll find out very quickly that you're going to be out of money. On the other hand, a novice can play slots for the first time and win right off the bat. If played right, these machines can have a payout of over ninety five percent, which is higher than any other casino game. With slot machines, it doesn't matter how often you play or how much you bet; your winnings all depends on how lucky you are. Because of this, the game can be seen as just a relaxing escape. There is no stress to win and there are no large risks involved. Anyone can enjoy slots, even if they have never played it. In the end, slot machines are there for people who want to play a game that can reward them, without all of the strings that come with other games. While other games require you to stay focused and think about strategy, slots lets you win while you sit back and relax.